WASHINGTON (April 19, 2011) -- The Army needs to plan now for a replacement helicopter -- one that has a longer range, is faster, can carry a bigger payload, is more survivable and that has a reduced logistical footprint. Army aviation leaders want such an airframe in less than 20 years -- and they say the Army can't afford to back down from that goal. Spc. Jose Palomino, Spc. James Cobb, and Spc. 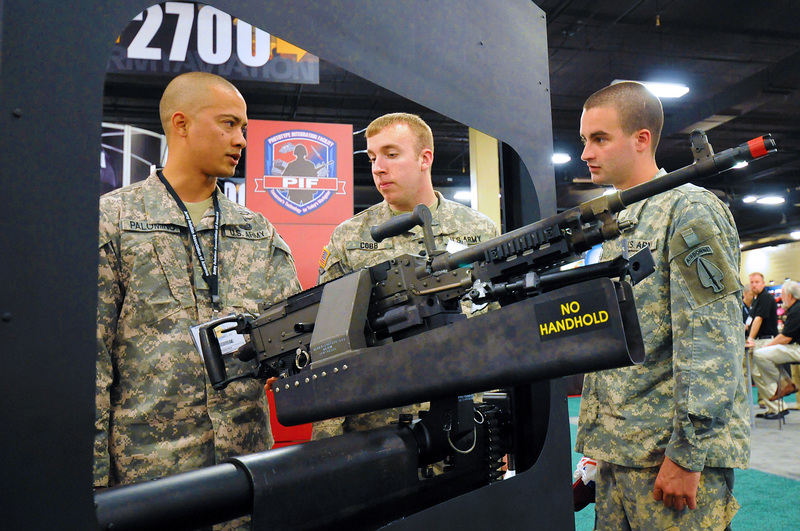 Kenneth Waller, look at a modified M240 machine gun that is mounted in a mock-up door frame from a CH-47 Chinook helicopter during the 2011 Army Aviation Association of America's Annual Professional Forum and Exposition in Tennessee. The M240's turret mount has been modified to ensure the weapon doesn't hit the window frame. "We know that the current fleet -- although great aircraft -- will at some point be obsolete," said Maj. Gen. Anthony G. Crutchfield, commander, U.S. Army Aviation Center of Excellence. He pegged an obsolesce date for the Longbow Block II Apache at fiscal year 2040, for instance, and fiscal year 2035 for the CH-47 Foxtrot. "It sounds like a long way away, but it really isn't," he said. "We have to have a method of looking out that far and making sure that we have aircraft that will be relevant in this future security environment. We have to set an aim point." Crutchfield may as well have stomped his foot on the stage in front of the more than 1,000 attendees at the opening of the 2011 Army Aviation Association of America's Annual Professional Forum and Exposition in Nashville, when he laid out that aim point to field a future vertical-lift aircraft by 2030. "We can't move the aim point," he reiterated. "2030 is the aim point. We're going to set it. We're not going to waiver. Our knees will not buckle and we are going to field this aircraft. I don't want my grandchildren to fly the 'Longbow Block LXXX' -- it's a great aircraft, but we need technology to take us further into that future." Acquisition practices, he said, could be part of ensuring that timeline for a future vertical-lift aircraft -- to avoid practices that contributed to the cancellation of the Comanche program in August 2004. "We can't afford to cancel another program. We can't afford another Comanche," he said. While he acknowledged that had the Comanche not been canceled the Army "wouldn't be in the great shape we are today," he did say that he disagrees with the circumstances that led to its cancellation. "What I say is, in my view, we can't afford to do it again," he said. "The future vertical-lift aircraft is going to have to increase range, speed, payload, survivability -- and it's got to reduce the logistical footprint. I don't believe we can do all those things just by incrementally improving our current fleet of aircraft. It's going to have to be something new." Crutchfield acknowledged the Army won't get "everything we want" in a new airframe, but he did say "we have to get everything we need. And I believe we need this. If we set the marker and we aggressively drive to it, we will make it happen. I know we can do it. In fact, we have to do it." That new aircraft was but one of Crutchfield's aim points. Another was developing adaptable leaders in Army aviation. "We've got to continue to build leaders that are adaptive, that are tactically proficient as well as strategically proficient," he said. Those leaders must be versatile, and prepared for an "uncertain future environment," where the enemy will use everything against them. "The future battlefield is unknown," he said. "One thing that is for sure -- (in) our future fight we're going to have to fight security operations, peace-keeping operations, counter insurgency operations, and full-scale war -- the full spectrum. What are we doing now to train, adapt and equip that future force?" Today at Fort Rucker, Ala., he said, future aviation leaders are engaged in training under Army Learning Concept 2015, an effort that, according to the Army Training and Doctrine Command, is "leveraging technology without sacrificing standards," and that "focuses on the opportunities presented by dynamic virtual environments, by on-line gaming, and by mobile learning." The learning environment for students at the Army Aviation Center of Excellence, the Army Maneuver Center of Excellence and the Army Fires Center of Excellence, for instance, is being enhanced by simulator training that ties them together across three states to allow those Soldiers to work together on operations training inside a virtual battle space. Gen. James D. Thurman, commander, U.S. Army Forces Command, served as the keynote speaker at the conference's opening. He asked the aviation acquisition community and industry to work harder together on improving acquisition in today's budget environment. The acquisition community, he said, has done a good job in supporting the war, but he called for "true acquisition reform," including aviation. "I am challenging both the industrial Army and private industry to conduct after-action reviews," he said "To understand what we have done over the course of the past few years, what we need to do in the future, and how we can adapt to increase efficiency of the system. We have to field platforms quicker, I believe, and aviation systems." Over the next 15 years, he said it is the Army's plan to build a force of manned and unmanned aircraft "optimized for full-spectrum operations." That effort, he told attendees, "amounts to a significant challenge for the Army staff, industry and the acquisition community." The general also called for a replacement for the Kiowa Warrior. "Our aviators and commanders are doing an outstanding job maintaining and employing the Kiowa Warrior," he said, adding that some units are putting as many as 100 hours a month on that airframe. In fact, he said, all Army aircraft are accumulating airframe hours at "four or five times the desired rate." "I believe they need a modernized scout helicopter as soon as they can get it developed," Thurman said. The general also pointed out that Army aviation gets some 21 percent of the Army's equipment budget. "You can count on pressure for your funding," he said. "The only way you can get this done is to achieve better efficiencies and work closer together as a team. Army aviation and industry must focus every dollar to achieve the best value." The headquarters of the conference's host unit -- the 101st Airborne Division (Air Assault) -- lies just 50 miles northeast of the Nashville conference center, at Fort Campbell, Ky. The division's deputy commander, Brig. Gen. Jeffrey N. Colt, spoke briefly at the start of the conference -- drawing attention to those attendees that make Army aviation successful. "Gathered at this conference are men and women, young Soldiers, seasoned warrant officers, veterans, civilians, and contractors -- who have all contributed volumes to defining the past, present and future of our branch," Colt said. "Their contributions make Army aviation, and our Army, the premiere and professional organizations the world's military services seek to emulate." Colt kept his remarks short in order to give the remainder of his time to the 101st's commander -- Maj. Gen John F. Campbell -- who spoke via prerecorded message from Afghanistan. "You have every reason to be very proud of the service and sacrifice of your Army aviators serving in Afghanistan," Campbell said. He said the two aviation brigades from the 101st Airborne Division -- the 101st Combat Aviation Brigade and the 159th Combat Aviation Brigade -- have rotated in and out of theater now for their fourth rotation and will continue to do so for both Regional Command-South and Regional Command-East. In RC-East, Campbell cited great support from two additional combat aviation brigades -- the 3rd Combat Aviation Brigade, from 3rd Infantry Division, and the 10th Combat Aviation Brigade, 10th Mountain Division. "All four of these combat aviation brigades provided superb support to our ground forces," Campbell said. "The fight in Afghanistan is an air-centric fight and truly we could not do all that we do were it not for Army aviation." The greatest praise for Army aviation came not from Campbell -- though he passed it on to aviators at the conference. "When I visit our troops and ask what they need, the first thing they ask for is more Army aviation," Campbell said. "You can be very proud of our Army aviators." The AAAA exposition runs April 17-20, at the Gaylord Opryland Hotel and Convention Center in Nashville, Tenn.